This is a very easy, but special looking and tasty dessert. It was a Giada Recipe but I can’t seem to find it online anymore so let me know if you find it and I’ll throw the link in here. So, the nice thing about this recipe is you can use whichever berries you prefer or you can make the ricotta cream and find other uses for it. Basically, whip the heavy cream til you get semi-firm peaks, add in your sugar and a little cinnamon (careful not to overdue the cinnamon), blend til the peaks are totally firm and then fold in your ricotta. Fold in any more sugar or cinnamon as needed, and maybe try to add a touch of salt as that may do wonderful things (I haven’t tried that yet). Berries- buy good fresh berries, whatever you like or is in season. 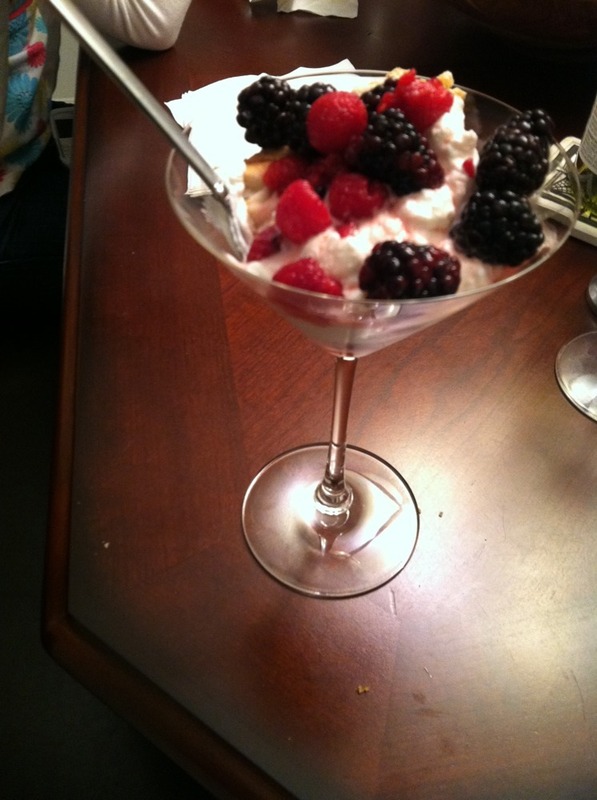 I like raspberries and blackberries so I went with those. Once I discovered they were a little tart and firm, I decided to add some lemon juice, sugar, and a touch of grand marnier so that the flavors and juices would blend overnight. Angel food cake-just use a nice store-bought angel food cake and cut 1.5 inch think slabs of them. You could use whatever you want here…maybe a cookie instead or brownie, or nothing at all if you just want the berries and cream…use your imagination. I did find sometimes if there berries don’t have enough juice that this dessert can seem kind of dry so I poured as much juice over it as possible. Other things you could do: a berry compote (smash up some berries and sugar), balsamic syrup, chocolate sauce, or a splash of your favorite liquor (a coffee liquor might even be nice). Serve in a martini glass or other fancy glass or bowl and layer as you see fit, making sure you have some berries or something on top as garnish. Note: all of these items above can be prepared a day or two before, so this is a great dessert for guests as it just has to be served up that day.